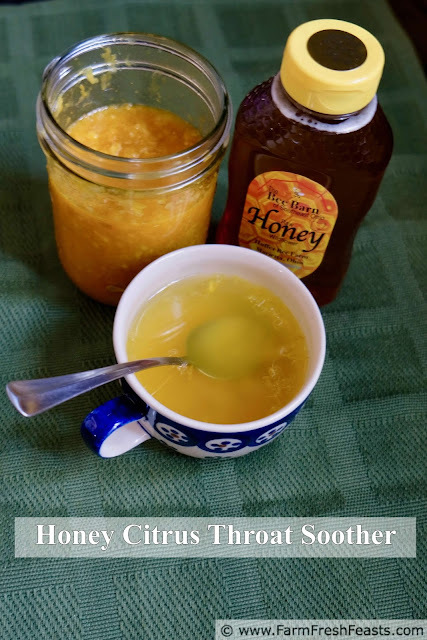 Honey Citrus Throat Soother is perfect for sore and scratchy throats during cold and flu season--made at home with all natural ingredients, this tastes good and is a lovely drink for warm sipping on chilly nights. It keeps in the fridge for up to 2 weeks and makes a great gift in the fall and winter. 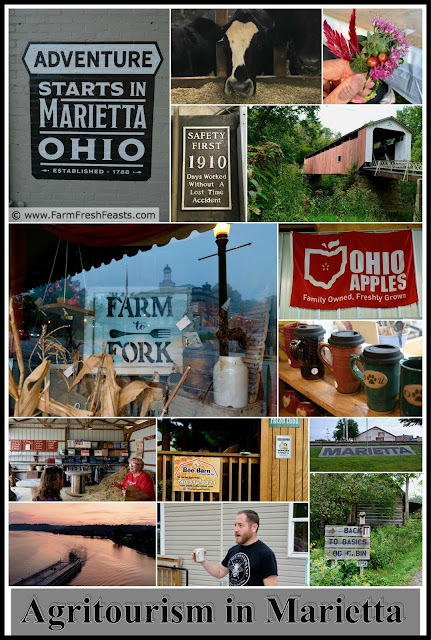 Disclosure:I spent 3 days in Marietta, Ohio on an agritourism press trip. I was put up, fed, and shown the sights courtesy of the Marietta CVB. In exchange, I have written this post--and two others, since I'm so charmed by this town and I think ya'll should visit. 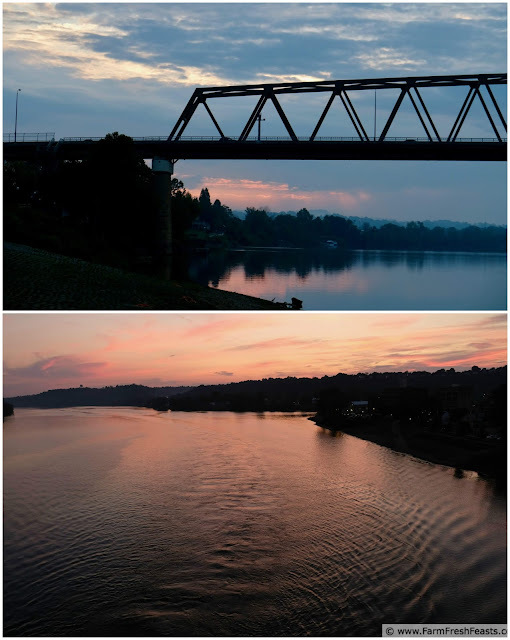 This post details a Couples Guide to Marietta, Ohio. Check out this post for a Family Guide to Marietta, and this post for a Girlfriends' Getaway to Marietta. My spouse is an active guy. No "lie in the sand" vacations for him. He needs to be going places to do, see, and learn new things. A visit to Marietta, Ohio would be right up his alley. We'd stay in the historic Lafayette Hotel right along the water downtown, so we could wake up and walk along the river checking out the birds. I saw geese, ducks, sandpipers and a great blue heron during my recent Agritourism Adventure in Marietta, Ohio. After a stroll across the pedestrian bridge, we'd eat a locally sourced breakfast at the Busy Bee Restaurant (he'd love the massive blueberry pancake). On the weekends, we like to hit our local farmer's market, so we'd be sure to check out the River City Farmer's Market and bring home some Broaster's Coffee for our son. We'd grab our tandem bike and go for a ride along one of the bike trails. If you don't bring your own, you can rent bikes at Marietta Harbor or Marietta Adventure Company. If you're not into biking, consider hiking, horseback riding, or kayaking in Wayne National Forest. For great views without all the cardio, how about a boat ride on the Valley Gem Sternwheeler? I'd like to take my spouse out to the Galley for dinner one night (and maybe live music? ), and check out the Marietta Brewing Company since both are easy walks to the Lafayette. While strolling around downtown, I'll bring my travel mug for an iced chai from Jeremiah's. Each place we live, we check out the local sights. Here in Dayton that's all about the Wright brothers and you can't go far without seeing a historic marker. Those markers are made in Marietta, Ohio at Sewah Studios. I was lucky to go on a tour, but if you can't get a group together, check out this video of how the business got started. Meeting the president, Brad Smith, I was impressed with the environmental stewardship of this company. 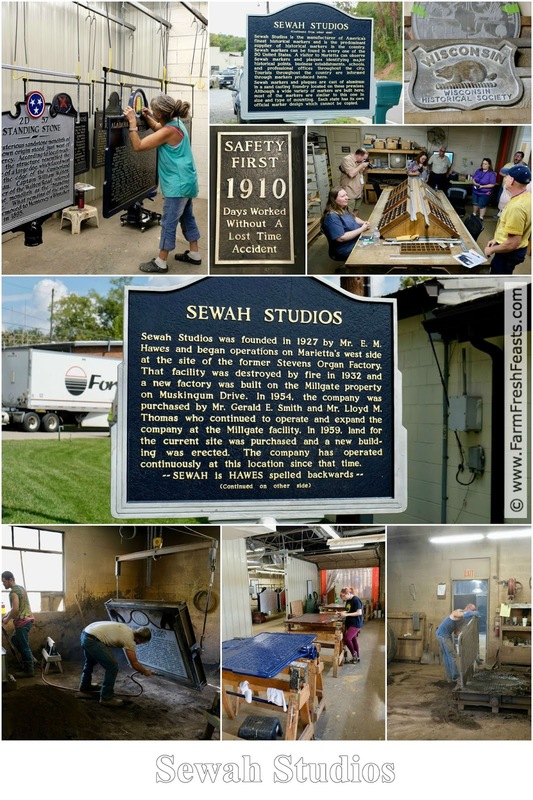 You might think that a factory is a strange choice for an Agritourism Adventure, but Sewah Studios uses locally sourced Ohio River sand, as well as powder coating, and recycling to reduce their carbon footprint. As Brad says, "the only real commodity wasted at Sewah is time and we rarely lose that". On our first date, my spouse took me to a million places in Germany including a pottery. A plate from Maria Laach has hung in every home we've lived since. Regular readers know that I'm a fan of Polish pottery--it's lovely--but useful enough that I use it every day. A stop at May Clay Pottery shop is definitely on our agenda, so we can check out Robin's beautiful--and very useful--creations. 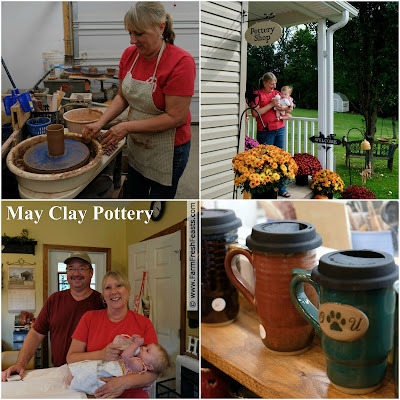 She's another local entrepreneur I met during my Agritourism Adventure--retiring from nursing to be a hands on grandma and potter who teaches classes and sells her creations throughout the valley. I was stung by a bee 40 years ago, and while I love honey, I have taken pains to avoid bees ever since. When I arrived in Marietta for my Agritourism Adventure I was asked 2 things: 'do you have any food allergies?' and 'are you allergic to bees?'. That gave me pause, but when we visited The Bee Barn of SE Ohio, David and Teresa Huffer were so patient and reassuring that I suited up and checked out their hives. The Huffers continued the entrepreneurial theme--David's retired from the police force--of my visit to Marietta. 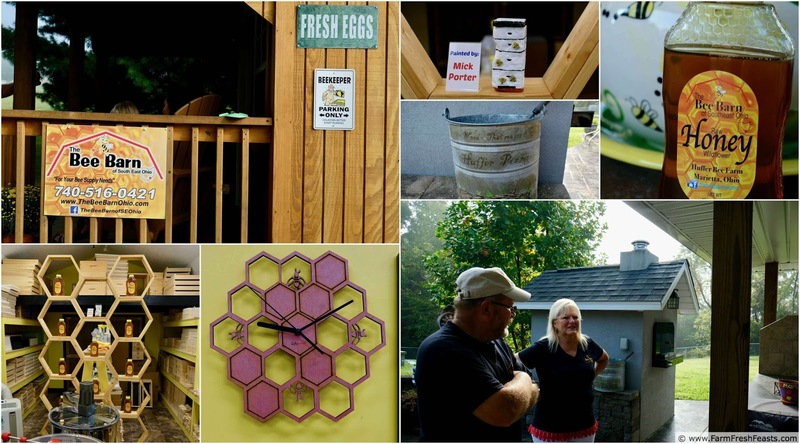 I'm not going to start raising bees (although David's comment that bees are 'tiny livestock' charmed me) but if you're interested the Huffers are terrific teachers and have what you need to get started in beekeeping. 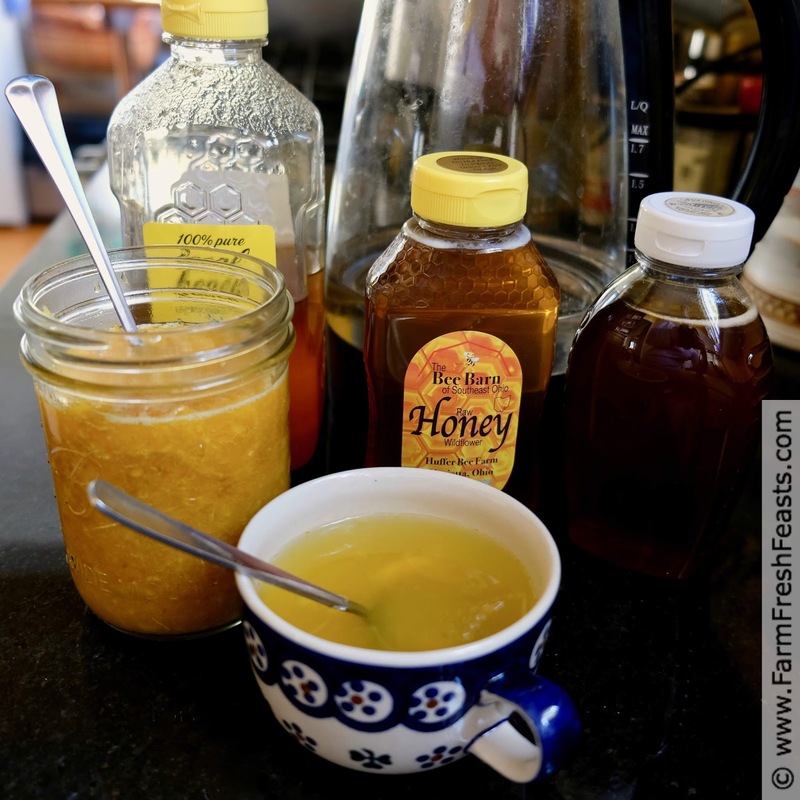 I did buy a bottle of honey, however, and that inspired me to share today's recipe using local honey. 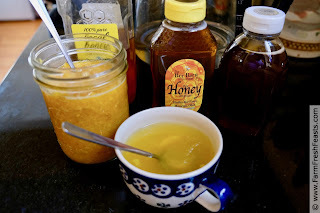 I keep a jar of this Honey Citrus Throat Soother in the fridge during much of the cold months. I give some to my octogenarian parents, to my friends who are under the weather . . . it's a useful concoction. I started by making this version, but found it's easier for me to use my food processor method below. Watch the video to see how to make this recipe! Notes: turmeric will stain your food processor. Stir in the turmeric powder after you've finished processing the ginger and citrus if you want to avoid staining. I'm sure you could use turmeric root--chop it like the ginger, and experiment to find the amount you prefer. Use local honey--farmer's markets and bee keepers are great sources for local honey. Add citrus and ginger to food processor. Pulse until combined. To serve, stir a spoonful or two into hot water in a mug. Add additional honey to taste. For more recipes using citrus, especially if you've ordered some marching band Fruit Fundraiser citrus and need ideas, please check out my Orange Recipes Collection. It's part of the Visual Recipe Index by Ingredient, a resource for folks like me eating from the farm share, the farmer's market, the garden, the neighbor's garden, and great deals on ugly produce at the grocery store. Pin to save this for later! I always add a little honey and lemon juice to my tea when I'm feeling under the weather. This seems more efficient. I love the music :) Thanks for this recipe - definitely will be kept on hand at all times this winter!